Lightweight and soft ear cushions allow for hours comfort day while listening to music, gaming, and voice chatting. 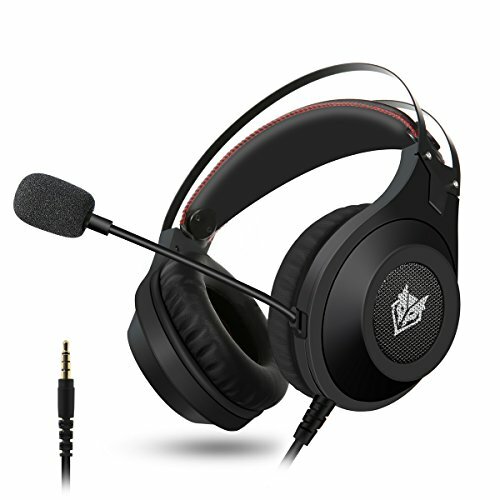 Gaming headphones with a clear, rich sound, your favorite gaming enjoyment. ELEGIANT gaming headset will be a great choice as gift for your children or any other gamers. 【Resonating Bass Stereo Surround Sound】Dual 50mm titanium diaphragm speaker drivers provide a crisp, rich and distortion free sound. Resonating bass offers a full range-listening experience. Adjusted by professional tuner team,strong bass, crystal clear audio, enjoy the wireless quality music, the best choice to play games. 【Unique Mic Noise Reduction Design】Noise-canceling microphone boom, perfectly captures the user's voice and simultaneously eliminates unwanted background noises. Humanized mic cover and mute control on the microphone ensure you are heard anytime you want. 【Automatic Adjustment & Comfort Material】The suspension style headband automatically conforms to the user's head and is designed for comfort during long periods of use. The memory foam ear cups seal out unwanted noises. All inclusive ear design, super light, based on ergonomic design, ear protectors are made of soft breathable protein leather, provide you with comfortable experience. Better suited for long time wearing. 【Rotary volume adjuster&Long Length Design】Rotary volume adjuster&Long Length Design-Rotary volume adjuster housed on the ear cups for convenient use 1.6 meters of tangle free braided wiring ensures longevity and no audio quality loss. 【Versatile Compatibility】 Works great with new Xbox One controller with the 3.5mm jack, PS4 Pro and PS4, as well as PC, Mac, and mobile/tablet devices with a 3.5mm connection.